Babinski decided to continue his education at Wayne State and earned his master’s degree in geography in 1977. Upon graduation, Babinski went to work as a drafting technician for the Michigan Wisconsin Pipeline Company before moving to California. He worked on the Prudhoe Bay Oilfield project for the Sohio Construction Company and later worked for Johnson Loft Engineers, where he oversaw computer-aided design (CAD) work. “Using CAD provided me with the opportunity to better understand how computer-based design and mapping could be best applied in the real world,” says Babinski. 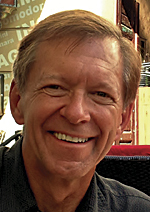 In 1989, Babinski went to work for the East Bay Municipal Utility District in Oakland, California, as the GIS mapping supervisor and began his lifelong affair with GIS. For the past 15 years, he has worked as the finance and marketing manager for the King County GIS Center in Washington State. The King County GIS Center is set up as an internal service fund within the county. “This allows us to control our own budget,” says Babinski, “but also means that we have to pay our own way. We rent office space from the county and purchase our own equipment and materials, as well as pay for network services, and so on.” A key part of Babinski’s job is to explain the benefits of using GIS to other county divisions and how it would fit into their workflows and support their business models. “The center is steward of hundreds and hundreds of datasets and data layers, and we can help county agencies make better use of them for mapping, applications, and analysis,” says Babinski. “The business advantage is that we can help these agencies see their data differently, which allows them to use it more productively.” Because agencies understand the business benefits, Babinski has developed a GIS funding model based on objective usage metrics that provides financial support from 35 county agencies, as well as external customers. “It is important for GIS managers to show their customers the connection between their financial support and the benefits and services that GIS provides,” says Babinski. The GIS center has three primary business lines, including enterprise operations for data management and system maintenance, matrix staffing for special long-term projects and programs, and client services in which the center acts as a consulting service. Ultimately, the client services section developed into the county’s GIS Services Express, which provides regional agencies with targeted, low-cost help to get the most out of their use of GIS. Users can select from an extensive menu of services and products, including GIS data, mapping, web design, database support, training, programming, and GIS program support. “GIS Services Express is based on the service delivery model that has successfully supported distributed GIS activity in King County for many years,” says Babinski. 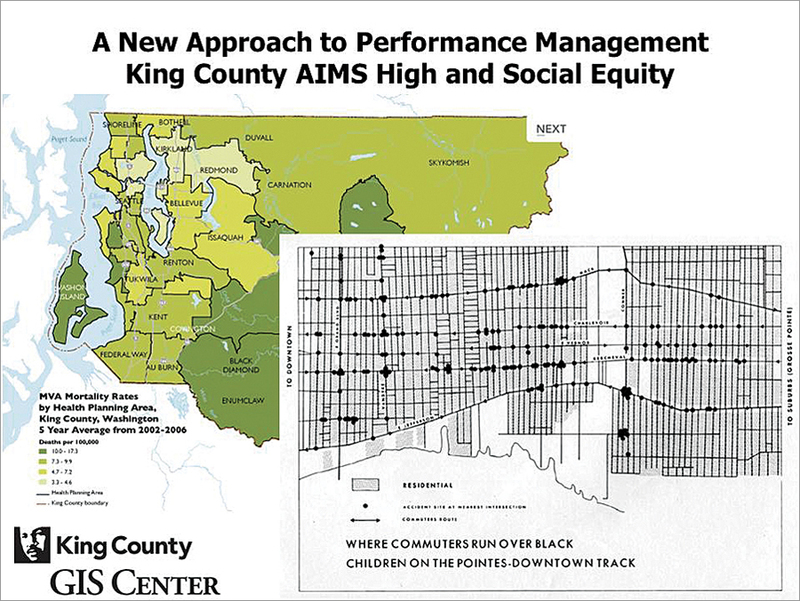 King County GIS supports social equity goals with geospatial awareness pioneered by William Bunge. A few years ago, Babinski contacted Dr. Richard Zerbe, director of the University of Washington’s Benefit-Cost Analysis Center at the Evans School of Public Affairs, to determine the feasibility of conducting an analysis of the long-term cost benefit of an enterprise GIS in King County. Cofunded by the county and the State of Oregon, Zerbe and his associates studied the use of GIS by the county from 1992 until 2010 and determined that during that 18-year period, King County accrued net benefits of between $776 million and $1.7 billion, with costs totaling $200 million (see “King County Documents ROI of GIS“). Babinski’s interest in this outreach comes from his longtime involvement with the Urban and Regional Information Systems Association (URISA), a national organization of professionals who use GIS and other information technologies to solve challenges in state, regional, and local government agencies and departments. Babinski has served in various national leadership positions in URISA, including secretary; treasurer; and, most recently, president. Babinski recently announced the GIS Management Institute (GMI), a new initiative by URISA (see “Geospatial Society, the GIS Profession, and URISA’s GIS Management Institute“), at the 2012 Esri International User Conference. According to Babinski, “GMI will develop resources and services that focus on promoting the advancement of professional best practices and standards for the management of GIS operations.” The new initiative will begin by building on resources that URISA has already developed, including the GIS Capability Maturity Model (see “URISA Proposes a Local Government GIS Capability Maturity Model“), used to assess an organization’s ability to accomplish defined tasks, and the Geospatial Management Competency Model (GMCM). The GMCM specifies 74 essential competencies within 18 competency areas that characterize the work of most successful managers in the geospatial industry and is an element of the US Department of Labor Employment and Training Administration’s Competency Modeling initiative. For more information, contact Greg Babinski, MA; GISP; finance and marketing manager, King County GIS Center; URISA GIS Management Institute Committee chair (tel. : 206-263-3753).